Need to upscale 1080p to 4K? 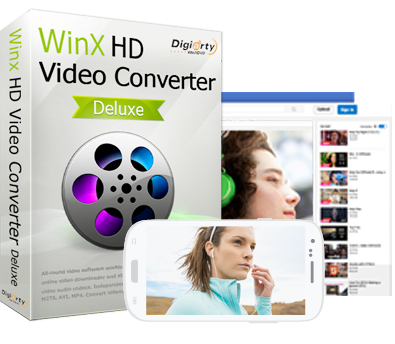 Use WinX HD Video Converter Deluxe! • Unique motion adaptive pixel scaling algorithm! Level-3 hardware acceleration. Theoretically, you won't see true ultra high definition effect when playing 4K video on 1080p TV, out of the physical limit of your display resolution. But 4K video does look better and clearer on 1080p monitors compared with videos in 1920 x 1080, for its four times more pixels, or rather YUV data. So, by analogy, can we say that 1080p native definitely looks worse on 4K UHD TV? Should we stretch 1080p manually to play in full screen on 4K display? If video quality degradation is an inevitable problem that upscalings face, is 1080p to 4K converter the best option to keep the highest possible quality? Let's see the following quick quizzes. Q: Is it possible to play a 1080p video clip on 4K TV? A: Of course 4K TV plays 1080p video. Playback error is mostly caused by incompatible video codec and has nothing to do with video resolution. Q: How does 1080p native look on 4K/UHD TV? • 1080p looks the same on a 4K TV after upscaling as it would on a standard HD 1080p TV. • 1080p looks slightly or significantly better on 4K TV than on 1080p monitors. • 1080p looks terrible on 4K TV. Q: TV vs. video converter software on the upscaling quality from 1080p to 4K? A: The short answer is HD video converter does far better than TV incorporated upscaling sets. Most of the time for most televisions, be it 4K or 1080p, auto upscaling makes the stretched image look worse in full screen, while HD 4K video converter software, for example WinX HD Video Converter Deluxe, upconverts 1080p to 4K with amazingly good quality. Why? It's all because of its unique motion adaptive pixel scaling algorithm, which adds new interpolated pixels calculated by the nearest sample points and controls the degree of diffusion/sharpening based on the input image. 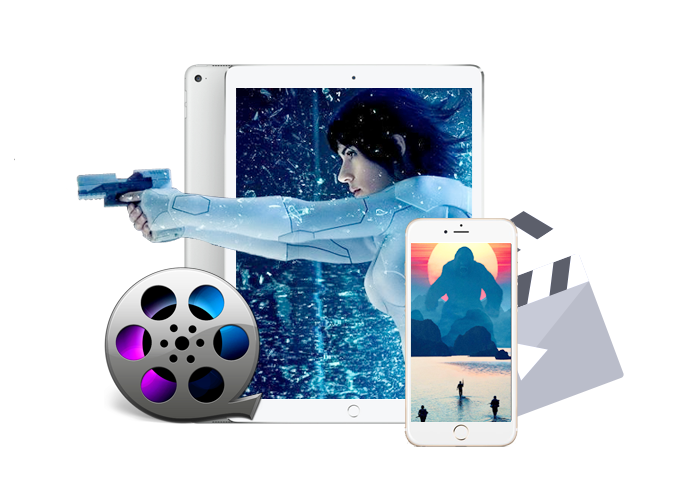 How to Convert 1080P to 4K with Converter Software? 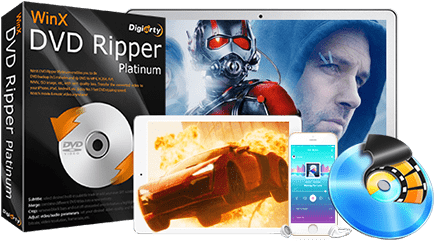 To test if 1080p to 4K video converter will output good-quality clips for playback on 4K TV, follow the next steps to download the converter software and then convert 1080p HD to 4K. We made an example of how to convert 1080p to 4K in MP4 and Level-3 hardware acceleration powered by Nvidia CUDA/NVENC is used here. You are also allowed to accelerate video conversion with Intel QSV. - Double click the downloaded .exe/.dmg file, get it installed and then open the program. • Click "+ Video" to import your local 1080p video. • Or tap into "YouTube URL" center, paste an online 1080p video link for analyzing and downloading, or for downloading and converting at one go. • The Output Profile window will pop up after file loading. Go to the "General Profiles" column, select the top listed 4K MP4 Video and click "OK" to move on. • To convert 1080p H.264 to 4K HEVC, scroll down to "HEVC Video" -> click gear-shaped icon to "Video Options" -> choose "3840x2160" from the drop-down list of "Resolution". • how to convert 4K to 1080p? Level-3 hardware accelerated 1080p HD to 4K video upscaler! 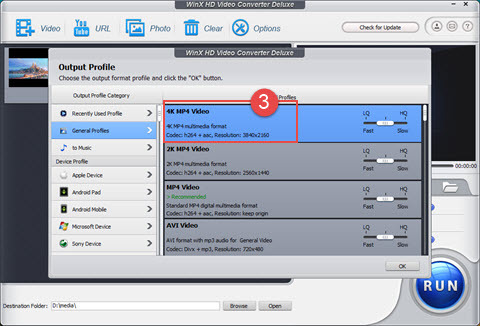 Get idea on how to enable Nvidia CUDA HEVC encoder and decoder with WinX HD Video Converter Deluxe to accelerate HEVC video conversions on Windows (10) PC. GPU accelerated 4K video converter to encode, decode and process 4K GoPro, DJI drone, monitor and YouTube UHD videos; compress and resize 4K 2160p videos fast making use of Intel Invidia AMD GPUs at high compression ratio and video quality. 2018 best fastest HEVC/H.265 hardware decoder & encoder supports Intel QSV and Nvidia NVENC hardware acceleration. Decode 4K HEVC MKV or encode 4K HEVC MP4/MKV video at fastest speed. Transcode 4K HEVC MKV to 4K HEVC MP4 in the blink of an eye. Although video conversion speed depends partly on the speed of computer and the settings for encoding/transcoding, the speed also has much to do with the converter you use. Under the same test conditions, 3 converters stand out. In this article, we would like to discuss hardware acceleration in Windows 10, including its definition, why and how to enable/disable it in Windows 10, and hardware-accelerated video transcoder which can greatly speed up video encoding/decoding speed.